Not much has changed from my initial forecast for Long Beach, as beautiful weather is still expected each day of the event. The weather pattern shown by the models continues to feature a mid and upper level low pressure trough that will be taking shape over Arizona and northern Mexico on Friday. Long Beach will be on the western side of this trough, under the influence of a dry and cool northwesterly flow. The only impact from this system will be breezy conditions on Friday, with a northwest wind between 10 and 20 mph, gusting to 25 mph at times. As the low pressure system departs and high pressure builds in, winds will become lighter on Saturday, and temperatures will get a little bit warmer, with highs reaching the lower 70s. Another weak upper level trough approaches the area on Sunday, and it may bring a little more cloud cover, but not enough to produce any rain. Winds will be light on Sunday, and high temperatures will reach close to 70. 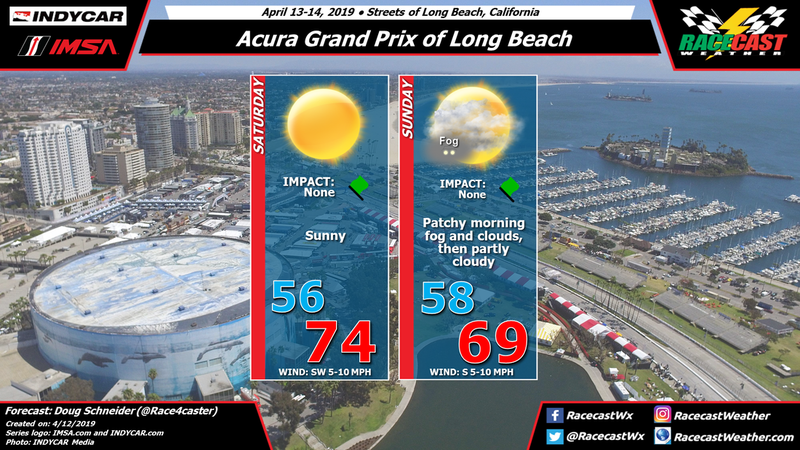 Yes, the graphic is a repeat from Saturday but the forecast hasn't changed so no need to do a new one... which is good news!!! 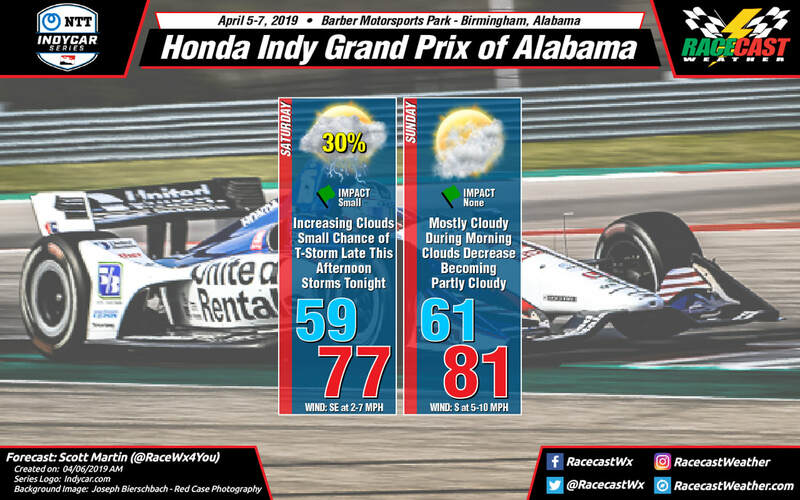 Skies are starting off the morning overcast and temperatures are in the mid-60s, but the good news is that there is no rain on the radar across Central Alabama and at Barber Motorsports Park. Throughout the day, clouds will slowly decrease and we'll have a mix of sun and clouds by the afternoon hours. The daytime high will be a warm one, reaching the lower 80s around 81 degrees. Winds will be out of the south at 5-10 MPH. 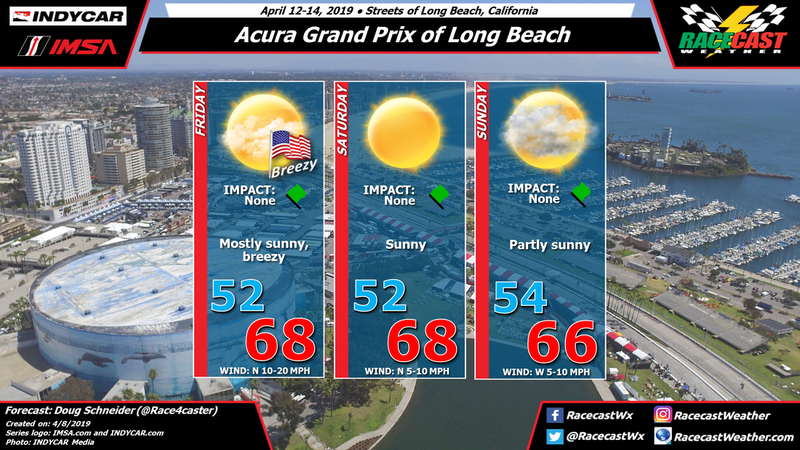 With the humid airmass in place, I wouldn't be surprised if you feel a few sprinkles early this morning, but rain will stay away from the track until well after the Honda Indy Grand Prix of Alabama has been completed.